Pastor Jim began his ministry here at FBC Princeton in 2015. Prior to that, he served in church ministries in California and the Pacific Northwest. 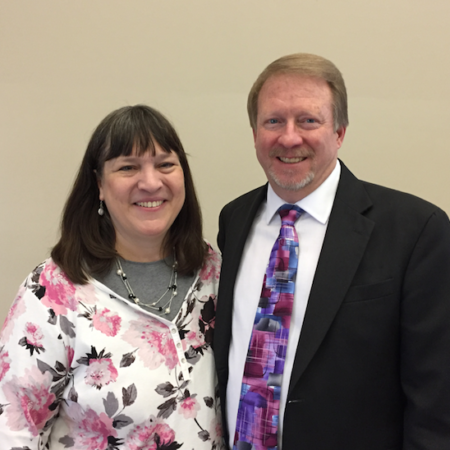 Jim and Kim are a happily married team of over thirty years; committed to loving and serving God together. PJ is a native Hoosier born into a pastor’s family where Christianity and ministry were core essentials. Following high school, he studied at Faith Baptist Bible College in Ankeny Iowa, and later completed his Master of Divinity in Pastoral Studies at Northwest Baptist Seminary in Tacoma Washington. Jim loves spending time in Scripture, sharing His love for Christ with others, and enjoying the great outdoors. His hobbies include fishing, rooting for his favorite sports team, and enjoying a cup of coffee with Kim. Kim enrolled at Faith Baptist Bible College where she met Jim and graduated with a degree in piano performance. Kim has been involved in many areas of ministry in each church where she and Jim have served. She enjoys supporting others and helping them develop their ministry gifts and has served actively in children’s education, music and in women’s ministries. Kim loves to read, dabble in crafts and has recently tried her hand at writing songs using Scripture. She enjoys inviting ladies in for coffee and especially spending time one-on-one. Jim and Kim have two daughters, Noel and Laurel, and a son Jonathan.